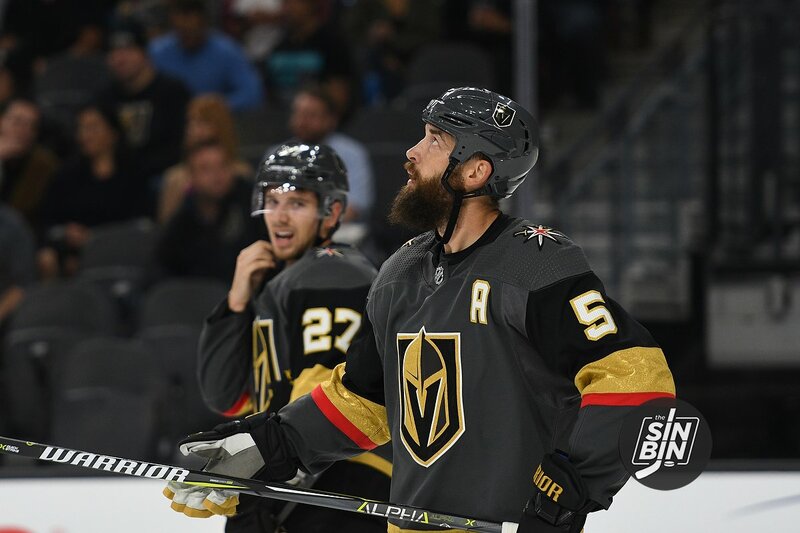 Last year the Golden Knights were one of just a handful of teams that did not have a player wearing a “C” on the ice. Instead, they opted for what they called a “leadership group” which was a rotating cast of about seven alternate captains. They went on to have an incredible season on the ice and players still rave about how amazing the group was off it. Plus, they were able to integrate new players starting a few days before the season began with Malcolm Subban, a waiver add in December in Ryan Carpenter, and the trade deadline acquisitions of Ryan Reaves and Tomas Tatar, without a hitch. Yet, the question still seems to be floating around the organization, who will become the team’s first captain? The short answer, and the right answer, is no one. Before Opening Night last year, the team announced Deryk Engelland, Jason Garrison, James Neal, David Perron, Luca Sbisa, and Reilly Smith would wear “A’s.” However, throughout the course of the season and into the playoffs Pierre-Edouard Bellemare became a staple as an alternate as well. With Garrison, Neal, Perron, and Sbisa all gone, there certainly could be some consideration to hand the captaincy over to Engelland. However, the more likely scenario is for the team to add players like Nate Schmidt, Jonathan Marchessault, Cody Eakin or even a newcomer like Paul Stastny or Nick Holden to Smith and Bellemare in the leadership group. The Golden Knights organization, especially when it comes to symbolic things, are very much believers in the “if it ain’t broke, don’t fix it” mindset. Thus, as Western Conference Champions, don’t expect to see a “C” on any players sweater any time soon. Although, the argument can be made that it is broke. No team since the 1972 Boston Bruins has won the Stanley Cup without a captain. The Golden Knights were three wins away from bucking that trend, but they didn’t. Personally, I’m skeptical that the lack of a “C” on a jersey was the reason, but hockey players are weird, so who knows what they believe. As long as Tuch keeps progressing, this will be the correct answer. I think Engelland knows that he only has a few years left and that weighs into his decision to decline it. They were Atlanta at the time. Calgary won in 89. Why wasn’t Lanny McDonald Captain????!! I’m deciding to delete that sentence because I cannot figure it out. It’s not important anyway. I love that we don’t have a captain. When the misfits finally hoist the Cup, it won’t be because they were just like everybody else.